into programs, restoration activities, land management plans, monitoring programs, and NEPA projects. involving agencies and stakeholders to assess climate change science and its implications for biophysical and social resources. providing the scientific foundation for mainstreaming climate change in planning, ecological restoration, and project management. with scientists, land managers, conservation practitioners, and other stakeholders to review the vulnerability assessment. Provide tools to implement adaptation options in assessment, planning, projects, and monitoring. Determine partners and team members, and resource areas to be covered by the vulnerability assessment. Regional office and science teams begin to collect data and conduct analysis for the assessment area. Process data, review preliminary results for vulnerability assessment, develop draft vulnerability assessment. Present vulnerability assessment, receive feedback on the assessment, and develop adaptation options. Conduct internal and external peer-review of the report. Project website for internal and external communication and marketing. 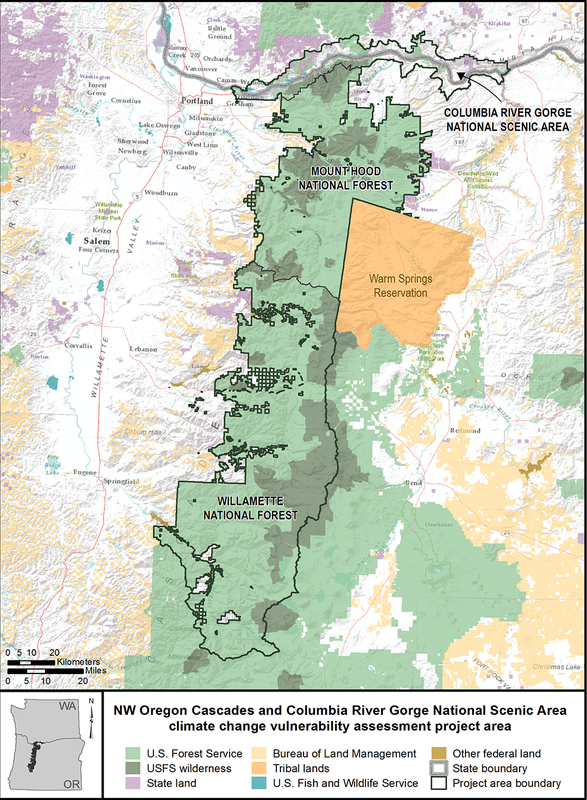 Published GTR: Climate change vulnerability and adaptation in the Columbia River Gorge National Scenic Area, Mount Hood National Forest, and Willamette National Forest. 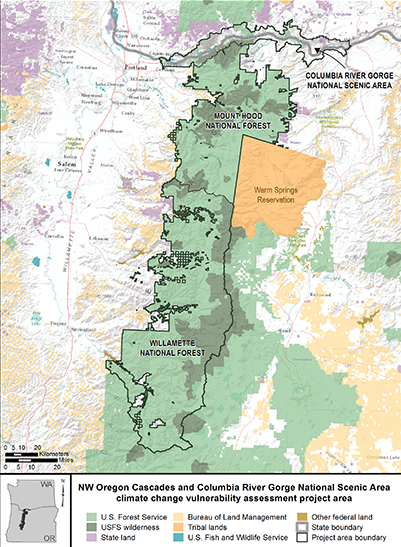 ArcGIS online tools including map gallery, data, and information for use at national forest level in projects and forest plan revision. Online library of adaptation options by resource area.